At Savvy, learning about our client's business is the most important step toward creating an effective advertising campaign. We find out who they are, who they're communicating to, their competition, their philosophy and their future plans. This process helps us in identifying goals and opportunities. Then we can develop a clear message, make smart media buys and create impressive and effective advertising. We take all of the pain out of media billing by managing all of the communications with the media outlets, the countless emails, proposals, invoices, and payments. From magazines to newspapers to tablets, print isn’t what it used to be. SAVVY helps you plan and buy print based on deep research of audience exposure. We include the latest innovations in print formats, geographic, and targeting formats. With over 35+ years of executing radio campaigns, SAVVY has earned the reputation of providing the best ROI in the industry. Very few agencies have the relationships and buying power like SAVVY. Our creative experts write strong calls to action to provoke powerful results. Adding 24/7 billboard advertising or other outdoor signage to your media plan can significantly increase your reach in the market place and your ability to connect to your audience. With a few details, we will quickly present you with the best available billboard locations. the future of full service! 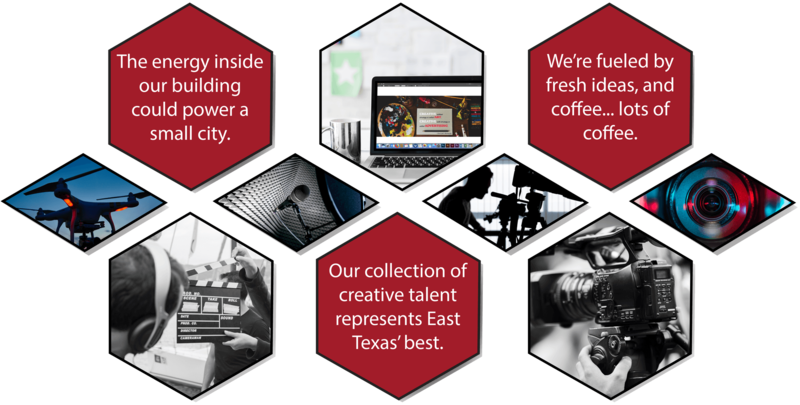 As one of East Texas’ leading full service agencies and video production companies, we have our own studio complete with a green wall for chroma-key, acoustically dampened sound booth, and cutting edge software for our graphic design and video editing departments. That’s what makes us so unique; we do it all, right down to your advertising specialties. At Savvy, it is very much a team effort in every department… They have the vision, passion and full-service creative expertise to make everything work together. Integrating multiple strategies and media into hard-hitting campaigns, they produce some mind-blowing work in the process that gets results.